When looking for a table saw blade that will give you the desired performance, it is best to look for a good quality one. It also pays to know the exact type of blade that you are looking for. Remember that not all saw blades are made equal, even table saw blades have some disparity among them. This article is essential as it will help you buy the best kind and quality of table saw blade. So please read it carefully and to the end. So What about Saw Blades? How do you identify the best blade for your type of cut? For starters, saw blades are a bit more specialized. In the market, you will find rip blades for rip cutting or rather cut with the grain ﻿﻿﻿of the wood. There are also cross cut blades which cut against the grain of the wood. In simple terms, there is a blade for everything; for cutting plywood, plastic and even laminates. Just keep in mind that each type of cut requires a different kind of blade; one that is specific to the kind of cut you intend to make. Significantly, what differentiates blades is the number of teeth they have, the gullet (space between the teeth), the design and configuration. These are what categorize the different types of blades into what they can and cannot do. Ideally, saw blades with more teeth tend to make finer and smoother cuts than those with the fewer tooth. However, more tooth is also a disadvantage in its way as it tends to be slower making cuts. Nevertheless, if you want to rip timber, then consider a blade with a lesser number of teeth although the cut will be a little bit rough. On the other hand, if you want to make a cross cut in wood, you will need a crosscut blade that usually has more teeth than the rip blades. This kind of blade will give smooth and clean cuts. Why the gullet? The size of the gullet is what will determine the efficiency of the blade to dispose of the excess material. A blade with fewer teeth will have a small sized gullet and therefore won’t work well in disposing of the material. Other blades like the combination and crosscut saw blades are usually designed with better features that enable them to give smoother cuts as well as dispose material faster when cutting. The tooth configuration is critical as it determines how well a blade cuts. When looking at the configuration, pay attention to the shape of the teeth and how they are grouped together. These are the three most significant items to consider when selecting a saw blade for your projects. With knowledge of the above saw blade distinguishing characteristics, making a wise choice for a replacement blade shouldn’t be much of a challenge. You only need to know what you are looking for regarding some teeth, the design of teeth and its configuration. Other features to look out for include; the kerf, how thin do you want it? The arbor size and the hook. Apart from that, you also need to consider the durability of the blade. Go for blades with durable materials the best ones are carbide tipped blades as they tend to last longer, maintain sharpness longer and also have better edge retention. Versatility is also essential. Since woodworking is a versatile field, you will need a blade that can handle various types of materials and not limit you to a few possibilities. Other than that, you need to consider the price of the product. You shouldn’t buy a blade just because it is expensive and you think that it is of the best quality. Price tags can be deceiving, so make wise choices regarding this aspect. Lastly, always buy blades with reasonable warranties. This assures you of better quality and service where if it happens otherwise, you can freely and easily claim a refund or exchange of the product. Known brands usually have better warranties. Our first product on the list is this 50 toothed, 10” inch blade. The blade comes featuring the same quality and precision attested in most of Freud’s cutting tools. 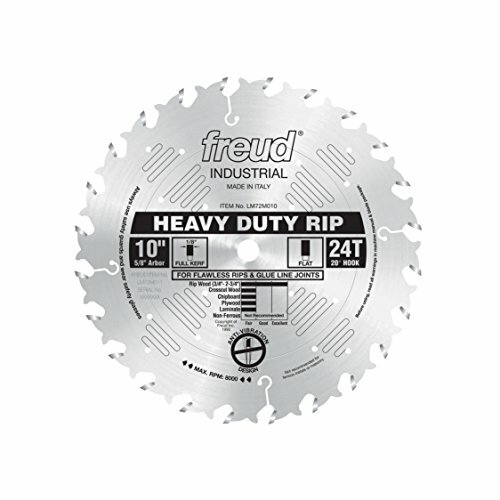 Crafted with the best design and innovation by Freud, this blade delivers top performance to woodworkers and other artisans that use table saws. First of all, this is a combination blade with carbide tips. The blade is capable of making various cuts; with this, you can make crosscuts, rip timber, chip boards, and also cut across plywood and laminate materials. This high-density carbide blade delivers a long lasting sharpness with improved edge retention. 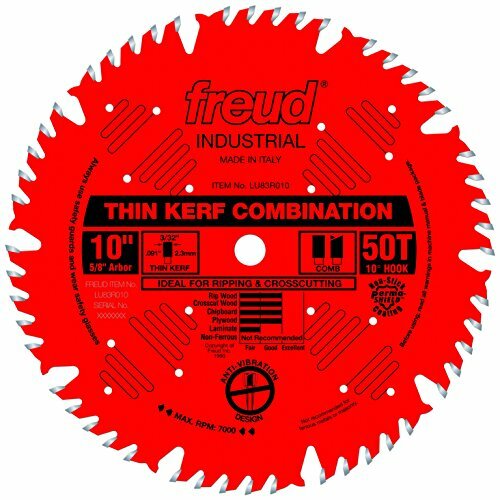 Apart from being carbide tipped, Freud has equipped this particular saw blade with Perma-Shield Non-stick coating to increase its durability. The shield is meant to reduce friction during cutting as well as protect the blade from corrosion and high impacts. The best part is that the blade can withstand any form of working condition both high and low impact with the same resistance. 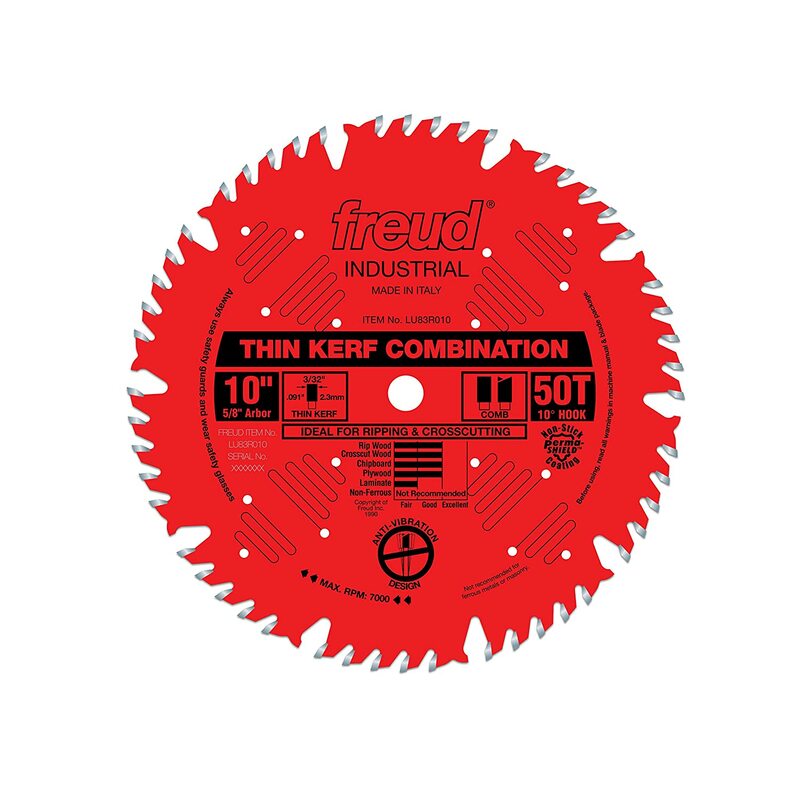 What’s more is that this Freud’s combination saw blade has a thin kerf design to avoid overwhelming the saw, a large gullet for effective chip clearance as well as a good quality blade for top accurate, precise and clean cuts. Another great advantage is the warranty that you get with this blade. Freud offers an unlimited warranty when you purchase this blade. Therefore you don’t have to worry as it you assures of quality and long-lasting performance. With its competitive pricing, this standard 10 inches 50 tooth blade will give you top quality and durable performance. So do not think twice about spending on it. 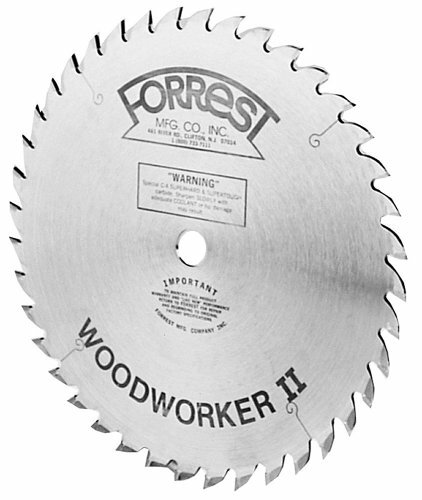 The WW10407125 Woodworker II is an excellently designed all around table saw blade for woodworkers. This blade offers a high cutting performance for both rip cuts as well as crosscuts. It is one of the best all-purpose blades in the market. Besides, it is a standard 10 inch blade with 40 teeth that will help you achieve very smooth, clean and flat cuts for your projects. The woodworking II is a high performance blade that cuts just as well as it is advertised. This blade can cut various types of materials including plywood and laminates without splintering. It is also equally excellent with hardwoods and other soft wood materials. This blade by Forrest has a thin kerf that delivers quality performance and smooth cuts without over burdening the saw. The 30 degree face hook angle provides for an easy feed and allows for smooth and clean cuts. The blade also has a 5/8” arbor to enhance the accuracy and precision of the cuts. It operates silently especially when cutting thicker materials. This blade is handmade, the plate is hand tensioned and is repeatedly straightened and re-straightened for maximum performance and flexibility. Even though the blade has been praised for its great blade edge retention capabilities, Forrest still offers customers with an amazing sharpening service for dull blades. This service is meant to help users regain their blade tolerance to levels that equals a new blade. Besides, there is a 30 day money back guarantee for customers that are dissatisfied with the quality of the product. 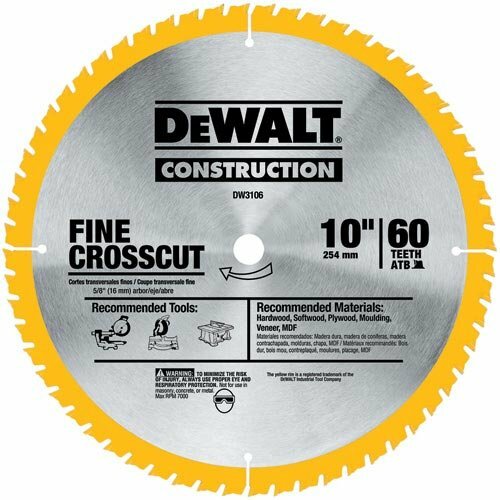 With the price put aside, this blade is a good quality all round table saw blade that will enable you make excellent cuts (both rip and crosscut) with minimal splintering. The LM72M010 is also another great blade option from Freud. This Italian manufacturers sure have won the hearts of many woodworkers both commercial and DIYers with their top of the range quality cutting tools. Not only does the brand use the best quality materials for their products, but the technology and engineering input in the manufacturing process is clearly evident in the final products in the market. For any serious woodworker, this is a highly dependable blade for rip cutting.The blade features a heavy duty saw blade which delivers excellently smooth, clean and fast cuts across both soft and hardwoods. The blade is sturdily designed and constructed with 24 teeth and with TiCo high density carbide tips and silver I.C.E coating which makes it quite long lasting. 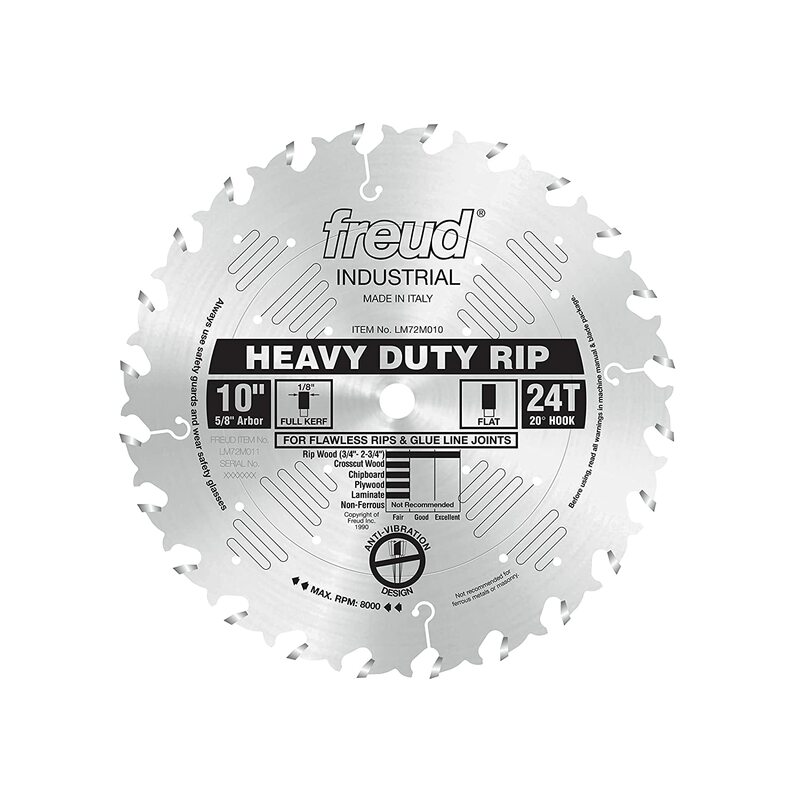 Additionally, unlike most rip blades, this one from Freud is equipped with an anti-vibration design which provides for stability when making cuts. It reduces errors and noise when working. The anti-vibration design also eliminates the need for stabilizers when using the blade on your saw providing you with more efficiency. I must mentioned that the 24 teeth with large gullets (for easy chip removal) make it easy to sharpen the saw and as many times as possible to prolong its longevity while saving you money at the same time. With all the features present in this blade, it is very capable of handling crosscuts with plywood, boards and, laminates. It can basically handle a variety of thin and thick materials. There isn’t a better blade at a greater price than this Freud’s 10 In. 24 tooth heavy duty ripping blade. The blade as pointed by its manufactures is an excellent choice for serious woodworkers. It will provide you with all the efficiency and functionally expected of a table saw blade. Dewalt is a widely known brand for various woodworking tools and most especially power hand tools. Be that as it may, the brand is also responsible for producing a variety of good quality tool accessories like this DW3106P5D60I Series 20 10-Inch 60T Fine Finish Saw Blade. However, it is not just about the brandname but about the quality and performance that this Dewalt blade offers. One of the main advices on using saws is to ensure that you use the right type of blade for each saw. For example if you are using a table saw you need to get the correct table saw blade to use. In this case, this Dewalt 60 tooth blade offers you a unique flexibility that you can use it with both a miter saw and a table saw. So if you have both, tools you won’t need to buy a separate blade for each saw. What then? You save money and get to use the blade on whatever saw you want depending on need. Besides being flexible, this blade is also super versatile, like most of the blades that we have already discussed here, this one is also packed with features that enable it to comfortably cut across hardwoods, softwoods, plywood’s, chipboards and even laminates. This is the right blade for those that handle a variety of cutting applications. The 60 thin kerf teeth play a big role in ensuring that you get the best quality cuts that are smooth, clean and error free. With a computer balanced plate, you get to work with a reduced level of vibration allowing you to make top quality and accurate crosscuts with minimal wastage of materials. To increase the durability of this blade, Dewalt has provided features such as the carbide tips and wedge shoulder design that allows the blade to give a heavy cut on hardwood and still maintain its edge and tolerance. With flexibility, versatility, high performance, tolerance and durability features, this blade by Dewalt is every woodworker’s dream of an affordable yet efficient table saw blade. Moreover, the package comprises of two blades where you can dedicate one for your miter saw and another one for the table saw. This is truly the cheapest blade in this lineup. Many of you may wonder how it made to this list, but the reason is pretty simple. It is because of its price and what it can do compared to most blades with a higher price range in the market. Remember that cheap is not always expensive. This Hitachi 311128 blade is made with an extra tough tungsten carbide that allows it to maintain sharpness for a longer duration than most saws in its price range. This carbide material is also highly durable and has a greater edge retention for smooth and clean cuts. For the average woodworker, tools that are sturdy and durable mean more saving and greater efficiency. This is exactly what you get with this Hitachi saw blade. You will get great and more cuts from this blade at a cheaper cost and for a long time. Most of the blades reviewed here cost no less than $50; this one, however, retails under $30 making it the most affordable item on this list and among the most affordable in the market. The item no 3 in this list is a 10 In. 24 tooth blade just like this one but it costs almost twice as much as this Hitachi blade. Also, this product is also designed to be able to cut through a variety of wood materials. It can cut through plywood, wood composites and even natural wood. Since they can cut a variety of materials, the blade can also be used for some cuts like crosscutting, ripping and even framing lumber. It is an excellent versatile blade for a table saw. 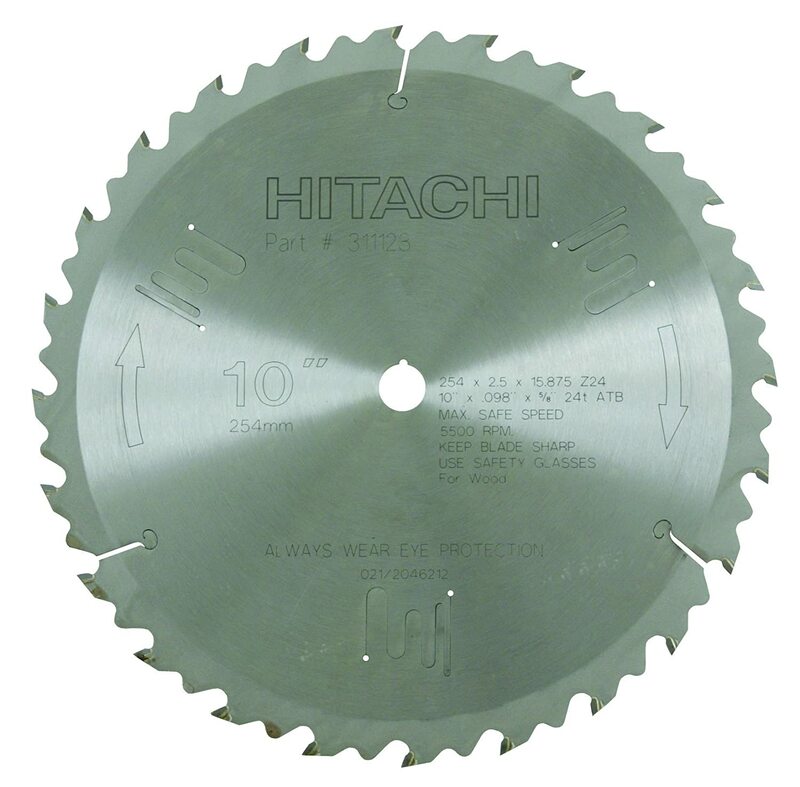 In the current market, finding a bargain table saw blade is not easy especially one that offers the level of performance that this Hitachi 311128 ripping saw blade has. I would therefore advice that you consider this blade if you are focused on affordability. Otherwise, look for a better quality blade if you want super smooth and fine finishes. Like I said, the best recommended way to use any type of saw is by using the right type of blade. However, choosing the right blade for your saw can as well be a challenge especially with the large variety of brands and types available in the market. If you’ve been experiencing difficulty choosing the best table saw blade, then I hope that this article will help you make better choices in future.